We used several different hitters in our four hour head-to-head test to derive insight for our 2017 DeMarini CF Insane review. Big hitters, tall hitters, base hitters, small hitters. We found, on the whole, the bat contains show stopping power when used by the right type of player—which tended to be a more advanced player on the stronger side. The CF Insane’s two piece design (derived by DeMarini from years of experience in the two piece composite space) felt as buttery as we ever remember any of the previous years’ iterations. Or any bat on the market for that matter. Big and advanced hitters who don’t struggle for bat speed and prefer smooth feeling swings, even on mishits, will be insanely in love. (See what we did there). Best price we found was here. DeMarini’s entire line of 2017 bats can be found in overview here. The 2017 CF Zen review, the CF Insane’s lighter sister bat, can be found here. Most notably, the bat will feature an end load, which to date, DeMairini has yet to produce in the two piece composite baseball space. (They have done this in fastpitch before). In essence, DeMarini took the heavier swing weight often left for the bats in their line up called the Insane (which were aluminum alloys in the baseball space) and combined it with the success they’ve seen in the two piece composite construction. The end result is a new addition to the market of end loaded two piece composite bats. Of note, the CF Insane’s endload will not be heavier than the 2017 Voodoo or 2017 One which will be released later this year. There is only one other end loaded two-piece composite bat in the market. That is the Easton MAKO XL. Both bats (the CF Insane and the MAKO XL) are top shelf performance bats made by companies with years of experience in the two piece composite space. Both perform at peak levels at many different pitch speeds and along the length of the barrel. 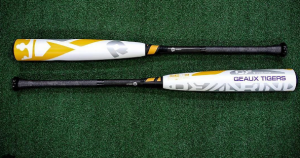 Easton owners would claim their bat has a larger physical barrel, but DeMarini owners would claim their barrel has more production along its length. The fact is, both bats are great and it would be unreasonable to think one somehow remarkably out rakes the other. Both are used at elite levels of baseball, both have massive sweet spots and smooth sailing composite barrels finely tuned. The CF Insane does boast the ability to customize the bat. For that it gains at least some points. At release, and for the foreseeable future, the 2017 CF Insane will come in only a BBCOR size. This means, only a drop 3 and only lengths from about 31 to 34 inches. This bat isn’t meant for the light of heart (or of muscle) — it is reserved for the big boys. Those looking for youth league, big barrel or senior league sizes in a more managable bat should check out the 2017 DeMarini CF Zen. Advanced players with good to great mechanics and a reasonable amount of power should really appreciate the more end loaded feel of the DeMarini CF Insane. We wouldn’t hesitate recommending the bat to anyone in that category assuming they are capable and willing to afford it. (Amazon Price Check). The bat, while claiming an end load, is still not heavy like many single piece aluminum or hybrid bats—but it is clearly more weighted in the end cap than the CF Zen. The 2017 CF Insane is a top shelf bat worthy of any serious, elite player’s bag.